Situated in the heart of the Llyn Peninsula. 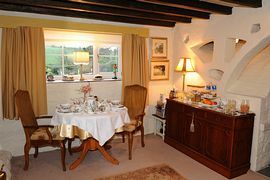 Welcome - B & B Accommodation in Luxury Suites within an old converted water Mill at Edern, near Pwllheli on the Llyn Peninsula. Nestling in a quiet hamlet at Edern, Yr Hen Felin (The Old Mill) offers supremely comfortable accommodation; warm neutral colours enhance the many period features of this converted old mill and touches of luxury ensure a memorable stay. Each stylish room, with bathing facilities, has its own character with sumptuous beds, fine linen and furniture. Your accommodation will always be chosen for its homely welcome, comfort and great food; you can be sure that you'll arrive to a warm, clean and well-prepared room. With a high level of personal service, the seclusion and tranquillity of Yr Hen Felin, offers the perfect location for a relaxing country and coast retreat, away from the hustle and bustle of daily life. It is an ideal base for walkers, cyclists, golfers, sailors and sea and country pursuits. There is ample well-lit private parking space for guests use. It is essentially a family home, which the owners and your hosts, Paul and Carys, feel privileged to share with you; they place great emphasis on guest care and comfort, in a welcoming Welsh and English speaking environment. They are a small and focused business, and your holiday time is as important to them as it is to you. Come and enjoy space and comfort at its very best. Yr Hen Felin is within easy reach of Ty Coch - the pub on the beach, the dramatic coastline of the Llyn Peninsula, the old market town of Pwllheli and the varied and memorable delights of Snowdonia. The castles of the bygone Welsh Princes and Portmeirion village of the renowned 'Prisoner' cult series and wonderful Italianate architecture, are only a short drive away. These can be enjoyed at any time of the year. There are numerous coves and beaches, either to sunbathe, swim or explore, within close proximity. Good restaurants, pubs and the local wine bar 'The Ship' @ Edern is only 100 metres away. Leave your car and walk to and from the Ship. Your hosts are more than happy to suggest great walks, where to visit and where to enjoy the tastiest local meal. They have substantial local knowledge and information, and are pleased to offer guidance to help and enjoy either the local area or the National Park. Gwasanaeth a Phleser ... Service with Pleasure. 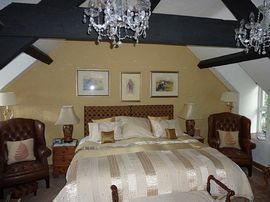 Rodyn Suite @ £90.00 per double occupancy. Red & Gold Suite @ £85 per double occupancy. 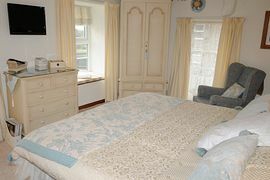 Blue & Ivory Suite @ £80 per double occupancy. 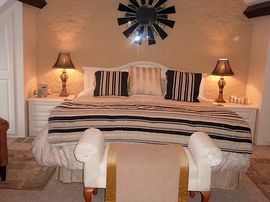 All prices are per suite p.n & inclusive of breakfast and are based on 2 people sharing. From the 4th of January to the 17th of December. Travel North West from the old market town of Pwllheli onto the A497 heading towards Nefyn. As you enter the village of Edern we are the old mill - down the hill and before crossing the old stone bridge. We are situated on the left hand side, there is a sign by the drive gateway.